People have been throwing shade at British Airways business class like shade was going out of style and there was a rebate you could stack on it. With rumours of cost cutting, and an expectation that the airline would keep something along the lines of the 8 abreast seating it currently offers in Club World, the rumour mill ahead of the the highly anticipated new Club World Suite unveiling was equally brutal. For starters, there’s a privacy door on each of the 56 Club World Suites, and direct aisle access to go along with it. That means when you pass out after a few glass of champagne or just a truly exhausting day, there’s no one to see you drooling, and if you need anything, the runway, or rather aisle is yours. You will be enclosed in your own world with a large 18.5”state of the art high definition entertainment screen, and enough hiding spaces for the crown jewels. We mean actual jewels, of course. Statistically speaking, the suite offers 40% more storage than the current Club World seat, with drawers capable of storing large electronics and whatever else you hauled on board, all at eye level, or nearby. Electronics feature the obvious things you’d hope for, like a fast and responsive entertainment screen, USB ports and separate power ports, but more importantly, there’s a vanity mirror, just in case anyone suffers from mid air vanity issues. No judgement! Jokes aside, it’s a useful tool. The bed features 79” of length and according to the airline, every effort has been made to maximise bed width for sleep comfort, in addition to soft fabrics to compliment the White Company bedding. In conversation with British Airways, it was apparent that the airline didn’t want that 79” figure to include unusable space, so when they say 79” it means actual space your body could occupy. A plane is a place where amusing things are constantly overheard, and British Airways is tackling that dire issue with these new Club World suites, and not only via privacy doors. Special dark fabric walls have been designed in each suite to dampen sound and noise from outside. For light sleepers, this is huge and for those with juicy gossip or MI6 state secrets, it’s probably big too. One last interesting tidbit: the suite is also the one and only customised Super Diamond seats to allow floor storage during taxi and take off. Basically, in other seats you’d need to put a purse, backpack or other item overhead during these stages of the journey, but in this suite, not so much. And with a fixed screen, you can watch your shows up until you hear the “ding” at the gate. It’s the little things, right? Aside from a top tier business class “Club World” suite, the British Airways A350-1000 features 56 World Traveller Plus seats and 219 of the latest World traveller (economy), all with next generation in flight entertainment and wifi. Whatever cabin you’re in, and realistically, whichever airline you fly, there are a few features which make the A350 arguably best ride in the sky. That’s not just verbiage, it’s science. By now, you’re probably wondering where British Airways first Airbus A350’s will be flying. The answer: the BA A350-1000 will launch initially this summer between London and Madrid for crew training flights, which you can totally book onto to sample the new digs. We heard a rumour that the plan will operate the first flight of the day from London to Madrid, when the launch happens. Once the initial intra European fun is over, The British Airways A350 will begin long haul service from October 1st son the Toronto route and Dubai from the 8th. Keep in mind: the plane won’t be on every flight, so it’s important to check what you’re booking. 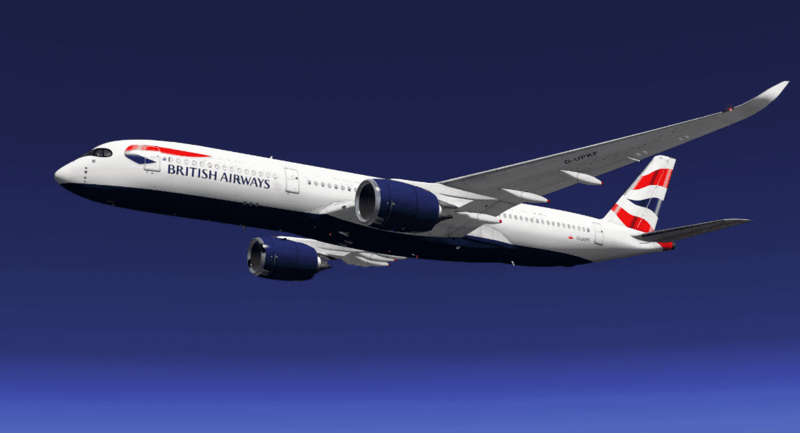 British Airways is aiming to roll out the new suite to Boeing 777 aircraft from late 2019 to early 2020, so expect to see 2020 to be the best year yet as far as the pointy end goes! The world was hoping for an improved seat that meant people wouldn’t have to step over each other in business class, and instead, they got served one hot private suite with doors. Cold champagne is not sold separately. This is the kind of move we were looking for from British Airways £6.5 billion investment plan. Roll on the A350’s! We’ll let you know when those summer intra European flights go on sale, because for 15,000 Avios, it’s an awesome way to close a door on a plane. A great step in the right direction for BA – best seat layout for Business Travellers too (can’t imagine anything worse than being stuck in a love-suite with a colleague). Just a pity the roll-out will, most likely, be painfully slow. I have to take a flight from Spain to London in September – should I book it now and hope I get this seat or will their be new itinerarys announced? 😆😆😆😆😆😆 Such a good move from BA, so happy. Assume it’s not possible to book the Madrid trial flights yet or Toronto? Won’t know official date for Madrid, but Toronto is on sale, I believe flight 93. Is this your gentle way of coming out to us, your loyal readers? hopefully they are able to retro fit planes quickly. with 3 seats a day being manufactured and cosidering other egs of KLM, AF and QR with regards to speed of retrofitting, I doubt we will see more than 10 to 15 planes by end of next year. Hopefully BA can accelerate this as the only thing it will create is frustration amongst all the pax missing out! But yes, well done to BA. hopefully a turn in the right direction at 100 years. I was really expecting a JAL like space suite 2-3-2 (not oman air 2-2-2). That would have been perfectly acceptable given the miserable CW at present! Shame that BA still has a ridiculous policy and charges Biz class and WT+ extra to choose seat 24 hrs more than 24 hours before departure. Hi Gib, surely BA Will now have to up their first class product as this new Club World suite looks as good or if not better than First and with a door!! Cubicles in the sky…. Air Dilbert. Looks horrendously claustrophobic to me. a GENUINE enhancement and surprisingly competitive hard product. I’m going to reserve judgement until we know how fast it will be rolled out (See WTP+, a *decade* after launching their “new” (MkII) seat there is still a possibility of booking and paying for a hugely inferior product, now worn and dated on a significant minoriity of the fleet. Of course the marketing makes zero mention of this fact. The vultures were circling and it looks like they only have the roll out timeframe to complain about now. How about they take all their planes out of service for a year? Credit where credit is due. Typical. Better than before but not good enough. The doors are useless when the partitions are so low. Look at other airlines in Asia, BA is still nowhere near. The Super Diamond seat is great because it has a lot of secure storage for a business-class seat but slapping a door on a standard Super Diamond seat and calling it a “suite” is…well, wrong. The door adds something to the seat but it does not create a suite in the literal definition of the word. A door serves primarily to increase weight and does little to increase privacy if the video screen has a camera staring at you 24/7.